The ad campaign is correct: Chevy Volt owners are happy. Keep reading to find out why. 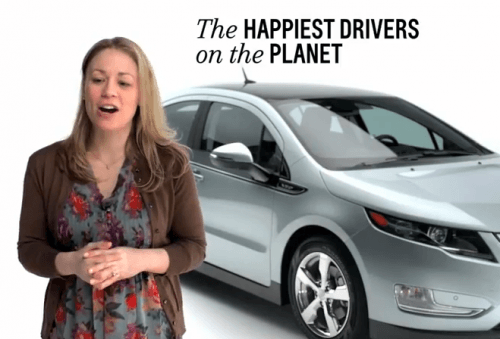 Are Chevy Volt owners really the “Happiest drivers on the planet” like GM’s popular ad claims? They are according to Consumer Reports. For the second year in a row, the plug-in hybrid electric Volt has topped Consumer Reports list for consumer satisfaction. In fact, the consumer watchdog site indicates that 92 percent of those surveyed stated they would definitely purchase a Volt again. That being said, the figure is down from 93 percent last year. The 2011 figure was only based on a few months of sales, and not a full year of sales like the 2012 survey. So what makes Volt owners so satisfied? Consumer Reports says that enthusiasm for the vehicle’s fuel efficiency ranks near the top of the list. Aside from its fuel economy, the Volt also earned high marks for its engine performance and sporty handling. Performance aside, customers are also likely enjoying the numerous incentives that GM offers. Chevy recently ran a promotion touting a $249 per month or less for a 24-month lease, not including extra dealer incentives. Additionally, all Volts come with a $7,500 tax credit, which brings the MSRP down to $31,645. One specific area where consumer enthusiasm is particularly evident is in the Chevy Volt’s sales. GM enjoyed it best sales month ever in October, selling 2,961 vehicles. Furthermore, the EV has sold 19,309 units thus far in 2012, a 286 percent increase over last year. However, Volt sales are expected to be down in November due to decreased supply. GM decided to shut down Volt production in September in order to revamp its Detroit plant. The automaker also halted Volt production in March, which resulted in the temporary layoff of 1,300 workers. In addition to earning the top spot on Consumer Reports’ owner-satisfaction survey, the Volt has earned several other owner-based accolades. Not only did GM’s plug-in hybrid receive Kelly Blue Book’s 2012 Best Resale Value Award in the electric car category, it also won KBB’s 2012 Total Cost of Ownership Award. The Volt has also received countless “Car of the Year” awards including the 2011 Motor Trend Car of the Year award, Green Car Journal’s 2011 Green Car of the Year award, Automobile Magazine’s 2011 Automobile of the Year award, and the North American International Auto Show’s 2011 North American Car of the Year award. As previously mentioned, GM has showcased some it’s satisfied drivers throughout a series of ads titled “Happy Volt Owners.” The campaign, which features real Chevy Volt owners gushing over their cars, is available to view HERE. The Chevy Volt plug-in is not the only fuel-efficient vehicle to score well on Consumer Report’s survey. In fact, the Toyota Camry Hybrid, Toyota Prius, Toyota Prius C and Nissan Leaf all fared well. Although the Leaf scored high amongst drivers, the Nissan Versa Sedan received the lowest score in the evaluation. Consumer Reports’ study is based on responses it received concerning 350,000 vehicles and over 240 models. Survey results are based on the percentage of owners that answered “definitely yes” as to whether they’d buy their current vehicle again considering price, performance, reliability, comfort and enjoyment.